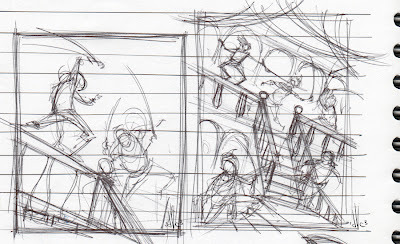 The above sketches are for an upcoming Alphabet Attack! 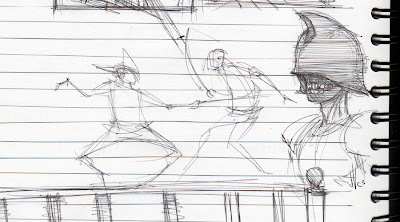 drawing, involving a brave hero facing off against demonic fencers. It kinda feels like I've been waiting my entire life to draw a scene like this. 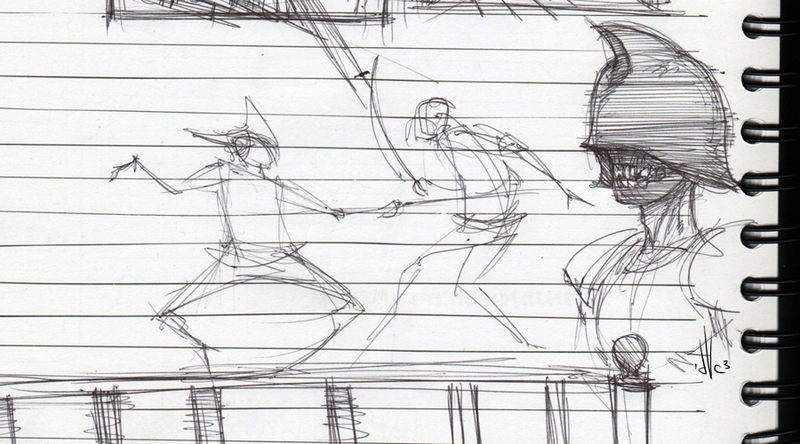 Especially when I consider that I grew up with a heaping helping of swashbuckling films. From Errol Flynn's Robin Hood & The 7th Voyage of Sinbad, to Luke Skywalker & Zorro, sword-swinging adventure has always held a special place in my heart & imagination. So it feels wonderful to aim for that same excitement in an illustration of my own. "If I don't get some fresh bread soon, gonna punch in yer face & bark at the moon!" 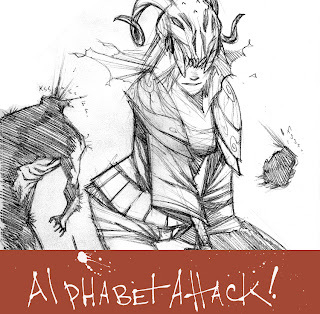 "Alphabet Attack!" Returns on June 3rd! 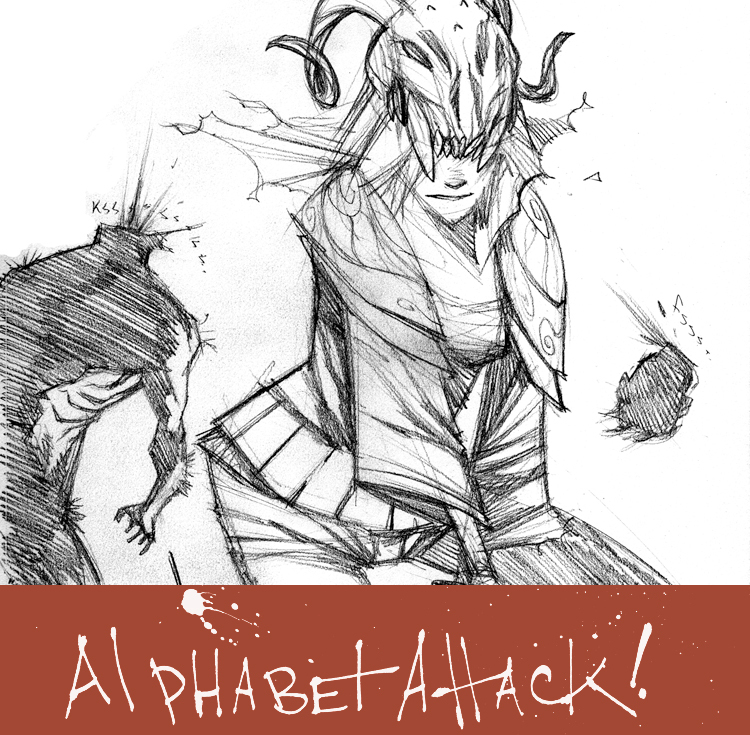 I'm proud to announce the return of my daily illustration blitzkrieg, Alphabet Attack! on Monday, June 3rd! Once again, I'll be posting new images Monday through Friday, for your eager peepers to devour. This will be the fourth series in my illustrated run from A to Z. And it promises to be ablaze with the raw imagination you enjoyed in previous installments of the blog. In a new twist, this series will consist entirely of black & white artwork. 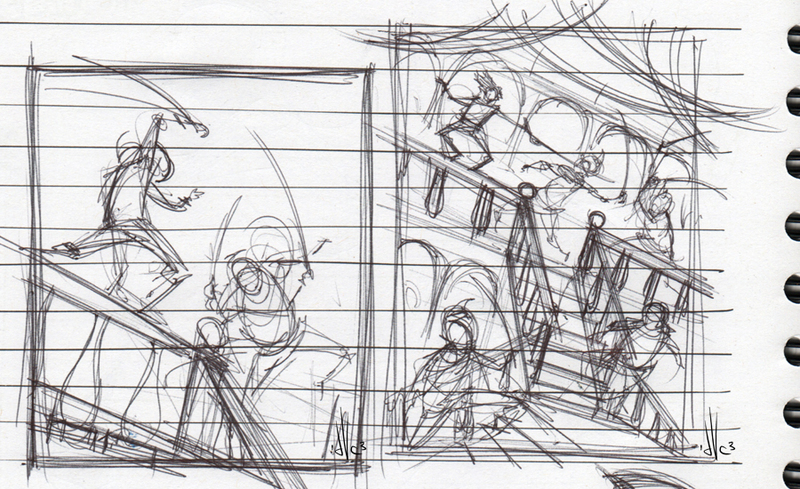 So I'll be challenging myself to tell clear, single-image stories, without the benefit of color. Guess it's time to stock up on the ol' india ink! Between now and the June 3rd launch, I'll be posting behind the scenes sketches, sneak peeks & insights on the art I'm developing. So stay tuned... there will be plenty to see, before the chum hits the rotor blade, in a few weeks. "We've come to far to give up who we are."